The 261 mph Bugatti Chiron starts at $2.65 million before taxes, if you convert from Euros. It looks better than the Veyron, goes better than the Veyron and cares even less of what we think of it than the Veyron. VW went all in because more is what customers wanted, and the result is more of a cool car. 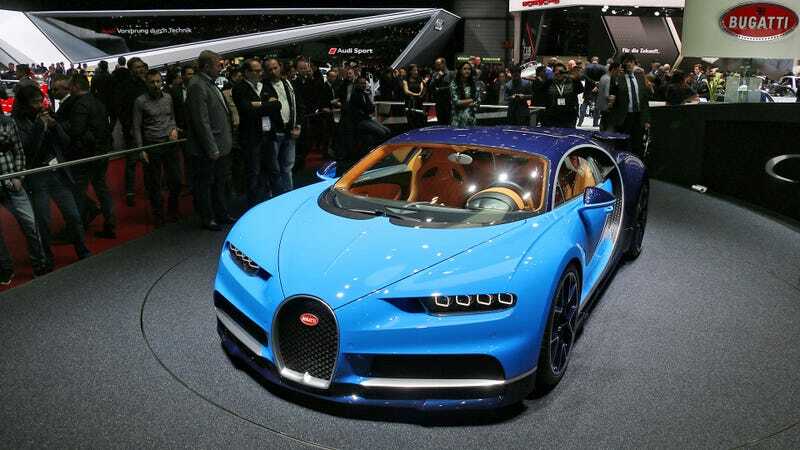 Because more is better but less is more exclusive, Bugatti will only build 500 Chirons, and claim to have sold almost 200 already. That gives you an idea about the buying power in this segment. When McLaren P1s, Porsche 918s and LaFerraris sell out almost as fast as $2 million Koenigseggs, brands like Bugatti have nothing to fear as long as they can keep on offering more. Uh-huh. Except that if you can afford a Patek, you’re more likely to wear it as well, while the Chiron slowly depreciates in a heated garage next door. But if you turn out to be one of those lucky kids who drives a hand-me-down Chiron to high school 10 years from now, I highly recommend making friends at Michelin in case daddy’s business interests couldn’t fork out more, even if Bugatti says Chiron tires will be cheaper and easier to install than the Veyron’s. Of course the Chiron is not as revolutionary as the Veyron was. It never had a chance to wow the audience with the same trick again. The world has caught up with the Bugattis, and while 1,478 horsepower and the 500 unit run still makes this the most powerful (and possibly fastest) production car on the planet, you know they had to claim that title from day one. That’s the whole point. Plus, they knew Koenigsegg is not interested in this game, and has no access to VW’s unique test track either to prove them wrong. But while Christian and his friends at Rimac might have stolen the Chiron’s thunder at Geneva, let’s not forget how much engineering is behind the product that gives VW a chance to be the self-appointed speed king for another decade. Packaging and heat management. The 8-liter quad-turbo W16 was a given, and there was no space for more, apart from the new turbos and air coolers. Weight, as the car already got over 100 pounds heavier than the Veyron. Timing. The Chiron was pretty much a completely finished project before all hell broke loose with Dieselgate, which has made VW accelerate its electrification program. Looking at it from another perspective, that makes the Chiron unique. When everybody made more torque with electricity, they gave Horacio Pagani a high five and kept burning high octane and high octane only. Since the technology under all that carbon fiber and the size or the proportions of the car weren’t going to change significantly, it was all down to the design team to come up with something that will make the Chiron stand out parked next to its predecessor and work as a base for undoubtably numerous special editions it will spawn in the next ten years or so. Luckily, the people behind the Vision Gran Turismo got enough freedom to go wilder with their pencils. The Chiron is full of interesting details. It’s a cool-looking thing despite weighing as much as two Lamborghini Sesto Elementos, and a significant step up from the Veyron’s rather conservative curves with a few classy nods to the brand’s rich heritage. Come to think of it, I’ll have to ask Bugatti how they made that tail light legal, because on the Volkswagen XL1, they couldn’t use a continuous LED line across the whole rear, that’s why there’s a gap in the middle. Either way, this is the official car of the Empire, the one Darth Vader would use to outrun the Rebel’s rubbish Landspeeders on the planet they completely turned into a drag strip for just that purpose, killing all life in the process. Of course the Rebels could always upgrade for a 250mph Koenigsegg Regera, but who are we kidding? They could never afford the sort of rides Darth Vader would buy using his black Amex and exceptional ability to persuade people when it comes to waiting lists. Have you ever seen a more impressive middle finger to the world? I certainly have not.